I probably have not invented something totally new here but I just love how it turned out. 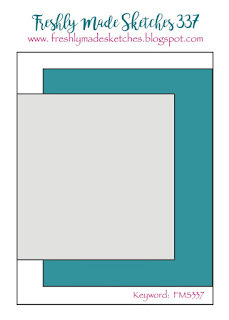 The Blueberry Bushel piece is just flat, a 4.25" by 5.5" rectangle (standard card size). Then the Call Me Clover piece is 4.5" by 7.5", folded in half and adhered to the right side of the card base. The thick Whisper White piece is 3.5" by 7.5", folded in half and adhered to the left side of the card base. I left the inside plain so I can write a message when I send this out. So let's talk new schtuff! First, new colors. Blueberry Bushel is pretty close to the old Brilliant Blue, which is great news for me because I use Brilliant Blue on my scrapbook pages A LOT and I only have a few sheets of it left. I love Call Me Clover too, though I can't remember offhand how close it is to Emerald Envy or any of the other past greens we've had. And Pineapple Punch is even brighter than the old Yoyo Yellow. But anywah, these three colors would be right at home in an 8-pack of basic Crayola colors and they're fun. I decided to get the Lemon Zest bundle now before it un-bundles with the new catalog and costs 10% more. I should pair up Lemon Zest with Mango Melody and make mango-colored oranges! Anyway, I should go rescue Ryan. He's getting into EVERYTHING today so I put him in his playard just so I could eat breakfast and type this up real fast. But now I'm fueled up with my morning tea, so I'm ready to chase him around. Cheers, y'all! That is a REALLY CUTE card. I thought the top piece was angled, but I see where you held it down, it is not. Ha! Would look good either way. Cute, cute sentiment. LOVE the colors, too. LOVE primary colors. I think that's why I bought Clara the table and chairs I did because of the colors. Do you think little man would like one of those? Clara sure uses hers a lot. I found an interesting one that I haven't looked at closely, but it is at Hobby Lobby and the chair and table legs are PENCILS. It's also primary colors. Hey, are you still thinking about making your own kitchen yellows and blues with white? LOVE that, too! The yellow just pops against those new colors! Pretty! Glad you joined us at FMS! What a fun fold and a pretty color combination. Thanks for joining us at Freshly Made Sketches this week! Now isn't that just brilliant. And now that I see it, I wish I had thought of it! Love the fun lemons and seeing you show off the new colors. How lovely! So glad you joined us this week at FMS!